the romans were experimenting with acupuncture; the idea still needed some work, though. Q: Why was Jesus always late for appointments after he rose from the dead? A: ‘Cause it took him all morning to do his nails. “Can you put me up for the night?”. Snort! Hot coffee spurting out the nose is a good way to clear sinus, though it does make your eyes water for a bit. Congrats on a bit more notoriety with Kenan Malik writing the forward on the Danish collection. 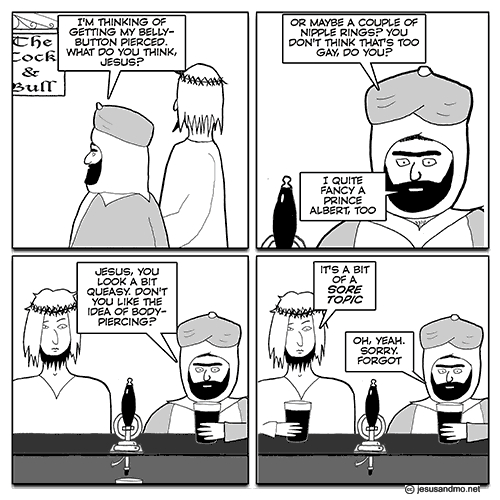 Gerry, thanks for the reminder for Blasphemy day. Nicely! 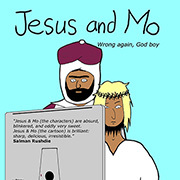 I thought Mo was going for a jibe at Leviticus 19:28 (Ye shall not make any cuttings in your flesh for the dead, nor print any marks upon you: I am the Lord). But, no! 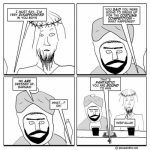 It’s a crucifixion joke. Sorry to diappoint you all. Not sure how one can ‘blaspheme’ something that does not exist. Better to drop it because the misguided could interpret celebrating blasphemy day as a tacit acknowledgement that there is something to blaspheme. Islam, refuge of the delirious. Nassar Ben Houdja, good one. No wonder many muslims are confused and aggressive. By the way, the Imam is a psychiatrist working in the NHS. Honest. So I tell you to hold up your right arm, and I carefully measure it; then I tell you to hold up the other arm, and I carefully measure that too; then I suddenly make nailing motions on both hands, and the punch line is: Got ya again!!! Jesus on a rubber cross. I bought some, and I can tell you, they really took the stigma out of my stigmata.